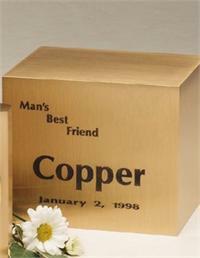 Available in three sizes, these cubes are made of heavy-grade sheet bronze. Surface is engravable. Comes with a plain surface. You may choose to add personalization as shown in photo. Would you like to have this urn engraved? UPPER case or Upper & Lower Case Lettering?